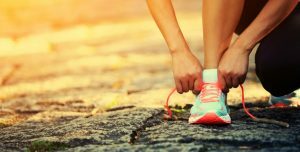 Not only do you get to move your walking and running outside, instead of being stuck inside on the treadmill, but you have more chances for outdoor sports as well. It’s definitely a good time to start thinking about golf, basketball, and tennis. However, you want the right gear so you can workout in comfort. Compression gear is always a good investment, especially if you workout and play hard. Not only will compression gear help you avoid blisters (try compression socks) and chaffing (get some compression shorts), but they can also assist in the avoidance of injuries and help you heal faster if you do get a sprain. Don’t just look for any type of compression gear. If you specifically look for clothing made for fitness you’ll find much of it made from materials that will help wick away sweat or even help keep you cool. You definitely need the right shoes for the right sport. Walking shoes and running shoes are not equal. One is made to assist in protecting your feet when you walk, while the other is made for more high impact movement, which will absorb shock. Your running shoes may even be more breathable. If you do a lot of running, walking, and sports, you may want to consider getting multiple pairs of shoes. Or, you might think about investing in one good pair of cross-trainers that will be good to use no matter what impact you’re going for. If you plan to do any walking or running at night, you need to have some reflective gear to keep yourself safe. Accidents can happen when you’re biking, jogging, or skating in the daylight, but they are even more likely at night if you aren’t wearing something that is making you extremely visible to drivers on the road. You can find shoes with reflective patches, belts made of reflective materials, and even socks or vests that have reflective patches on them. Any of these will do and will help keep you safe. Your outdoor fitness equipment may vary a bit from the items you use indoors. If you want to get serious about working out, you may want to invest in something fun like a bicycle or some rollerblades. Other equipment that could be useful are some weights made for walking, whether you want hand weights or ankle weights. If you’re accustomed to a walking workout, these weights can add something more to your routine to help you lose more weight or build more muscle.